This weekend there is a Film Festival at the MOBA (Fashion event) in Arnhem, the Netherlands. It is all about Diane Pernet and her ASVOFF ( A Shaded View On Fashion Film). “Since its launch in 2008, ASVOFF (www.asvoff.com) has gained critical acclaim for encouraging both emerging and established artists to reconsider the way that fashion is presented and for challenging the conventional parameters of film. ASVOFF debuts in Paris during fashion week and tours the globe with subsequent screenings at prestigious institutions and events like the Barbican, the Guggenheim and Cannes Film Festival in a host of creative capitals such as New York, London, Tokyo, Milan, Moscow, Mexico City – and in this January at the Caixa Forum Barcelona in the Spanish city. ASVOFF is not only a competition of short fashion, style and beauty films but also a travelling international event showcasing feature films, documentaries, conferences, performances and installations – making it a must-see on both the fashion calendar and the film circuit. Genre-bending and groundbreaking, it has already brought together such illustrious names as Chris Cunningham, Róisín Murphy, Nick Knight, Erwin Olaf, Nobuyoshi Araki, Tilda Swinton, Steven Klein, Mike Figgis, Chloë Sevigny, Dita Von Teese, Max Vadukul, Bruce Weber and Ryan McGinley as well as Yves Saint Laurent, Gucci, Gareth Pugh, Sergio Rossi, Hussein Chalayan, Mr. Pearl, Rodarte, Givenchy, Yohji Yamamoto & Thom Browne. 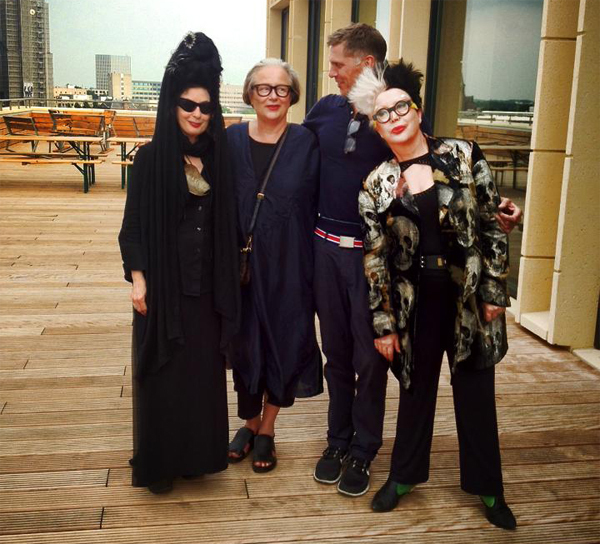 Here is a photo of Diane Pernet, Lidewij Edelkoort, Erwin Olaf (famous photographer) and Orlan (artist), taken at the MOBA in Arnhem.